Compensated Temperature Limits: 40 to 120°F (4.44 to 48.9°C). 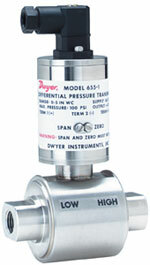 Pressure Limits: 300 psi (20.7 bar) continuous; 2000 psi 137.8 bar) burst. A zero shift of up to +/- 2% F.S. may occur when 300 psi pressure is applied. Thermal Effect: 0.025% F.S./°F (0.045% F.S./°C). Power Requirements: 16-35 VDC (2-wire). Zero and Span Adjustments: Accessible potentiometers. ±10% of span. Current Consumption: DC; 38 mA max. Electrical Connections: 3 position plastic terminal block. Process Connections: 1/4" female NPT. Weight: 1 lb, 11.7 oz (785 g). CAUTION: Do not exceed specified supply voltage ratings. Permanent damage not covered by warranty will result. This device is not designed for 120 or 240 volt AC operation. Use only 16 to 35 VDC.